Two-stroke vehicles, especially motorbikes are known for their inefficiency i.e. energy consumption is higher due to the way the fuel is incompletely burned and wasted out of the exhaust pipe. But people innovate and who say motorcycle cannot be made 'cleaner'. Hobbyist who like riding their big-engine motorbikes, as well as clean energy enthusiasts will definitely find this interesting. SunRed demonstrated that you can ride your favourite bike and at the same time be a green advocateur. Think about all those hours the motorcycle is left parked under the baking sun. The bike gets its power from this. 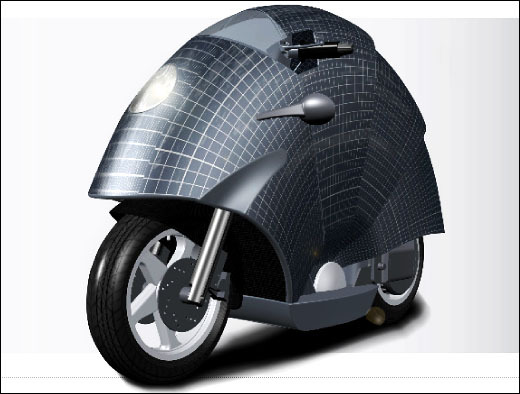 Also, due to the snail shape design, solar plates are installed in such a way that they harvest energy from the sun no matter how the bike is positioned. The prototype design of solar-powered bike by Spanish automotive company SunRED was showcased in an autoshow in Barcelone and won the prize for best innovative. 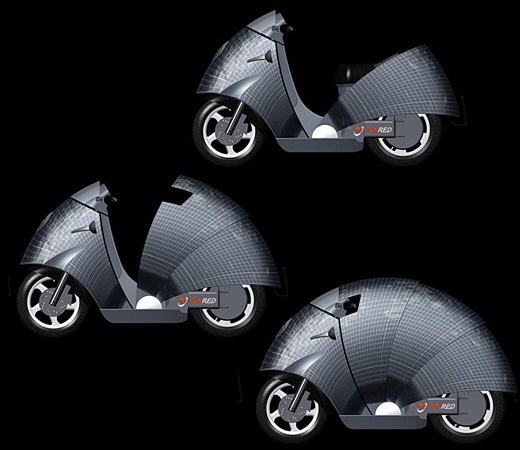 BusinessWeek reported that the bike’s 3.1 sq meters of armadillo-looking solar panels soak up the sun’s rays while it is parked, then retract to reveal the driver’s seat when it is time to go. While an alternative power source has yet to be included in the design, the solar cells alone would allow it to reach speeds of up to 48 km/h and a range of up to 21 km. SunRED's snail shape design bike. Or scooter, if you like. The project is still on-going and SunRED is collaborating with Quimera to build a complete purpose-built electric platform that allows customization to any type of bike/scooter. Once completed, it will be capable of recharging through both solar panels and plug-in electricity. The hybrid charging methods can take the bike around 120km of traveling with top speed of 100km/h. 120 km range is more like it, because a bike that can travel 21 km in a single charge is not really appealing to many. I like the armadillo or pangolin-shape design. On one hand, it says many things about nature and the impressive innovation of the solar modules; what you normally see is the square design. On the other hand, I am not too sure about the efficiency of the solar cells so arranged. Mcm tengiling ajer motor ni! wow, such a stunning futuristic bike. i've not seen an incredible bike like this before. love the brilliant concept. Nice concept.If you commercialize this then sure I will buy it at any cost.Please try to make it more efficient.Armadillo shape is magnificent. Does it cost a bomb? even in production yet? I have a Harley and am happy with it. Solar Powered Motorbike is great idea. This will be exciting for the bikers like me. I am astonished that its Top speed is 100 km/h and charging time is 70% in 1 hour. It's Unbelievable. I would like to buy it.